So the question and the challenge is this, what are you going to do today and planning on doing tomorrow and each day going forward to grow closer to God? Any relationship takes work and especially your relationship with God takes commitment an investment of time for it to grow! My prayer for you and I is that we'll keep seeking The Lord and seeking to grow in our relationship with Him each day finding at least that 1 thing that will allow you to grow still more for His Glory and your good! 1- Regularly get into and stay in His Word - Study His Word! 2- Seek Him through prayer! - Communicate with Him! 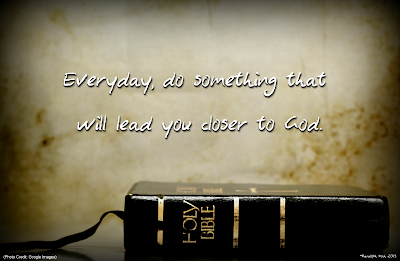 4- Live a Spirit-filled and Spirit-Led life for by taking God's Word and actively living it out! Have a great week ahead and may you actively seek Him will all of your heart, soul, mind and strength!